Tom Gentile writes: The last two weeks have seen significant market action in both directions. And it’s just more proof that you need options in your portfolio to help cut your risk and boost your potential returns. Traditional buy-and-hold investors have been taken to the cleaners by whip-saw markets. While I expect this increased volatility to continue as we head into September and October, things seem to have settled down for the moment, and the markets have, for the time being, resumed their upward march. So I want take this opportunity to reexamine some of the fundamentals of options to help reinforce your understanding of the more sophisticated topics we’ve been covering lately. It’s crucial that you have a strong grasp of the fundamentals, especially if you’re new to the material – you won’t be a master trader until you have this stuff down. If you’re familiar with options, this a great opportunity for your to brush up on the basics – you may even learn something new. If you’re new to options trading or to Power Profit Trades, you’ve picked the perfect time to join us. Let’s start from the beginning with a very simple definition – an option is a contract that gives the owner the right to buy or sell a financial product at a specific price on or before a specific date. When dealing with equity options like we do here at Power Profit Trades, that financial product is usually a stock or an ETF. A put option gives the owner the right (but not the obligation) to sellthe underlying instrument on or before the expiration date. You profit on a put when the underlying instrument decreases in price. Calls and puts are bought to establish a long position, or sold (also known as writing) to establish a short position. However, selling-to-open an options position obligates the seller (or writer) to fulfill their end of the contract. Writing options is very risky unless you put on a simultaneous long play to cut that risk. My Money Calendar Alert subscribers do this all the time with my recommended “loophole” trades. The term for the specific price at which an option contract is exercised is the strike price. The number of available strikes (options) on a given stock or ETF is dependent on a multitude of factors. For one, the range in which an instrument has recently traded plays a part. If you have a stock that has traded between $50 and $100 over the past six months or so, there will be strike prices around both of those prices and in between. How in-demand the options are also speak to the number of strikes as well as which expiration months are made available. For stocks priced from $5 to $25, the strike prices are usually listed in increments of $2.50. For stocks priced from $25 to $200, the strikes are usually found in $5 increments. From $200, they are typically listed in $10 increments. Depending on demand, you may see strike prices listed in $1 increments. When demand is really high, there can be as little as $0.50 separating one option from the next. 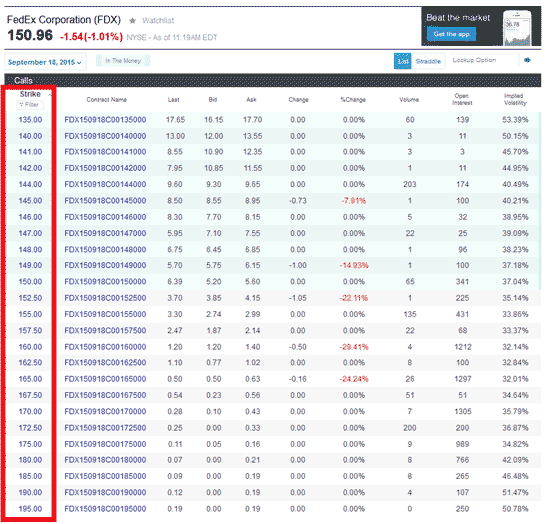 Below is a snapshot of the September 18, 2015 call options for FedEx Corp. (NYSE:FDX) as listed on Yahoo! Finance. As you can see, the prices reflect the stock’s trading range over the last few months, and the strike prices are mostly in $5 increments (especially at the high and low end, where there is less demand). Where demand is higher, the strike prices are in $2.50 increments. An option’s strike price helps to determine its intrinsic value. That’s the difference between the strike price of your option and the market price of the underlying instrument at any given time- if the difference is negative, your option has no intrinsic value. However, that can change over time. In the Money (ITM): Your option has intrinsic value and is worth exercising. For calls, that means the strike price more than the market price of the underlying instrument. For puts, that means the strike price is less than the market price for the underlying. Having in the money options doesn’t mean you’ll profit, just that your options have intrinsic value. At the Money (ATM): Your option’s strike price is exactly equal to the price of the underlying instrument. While your option has no intrinsic value, it can easily gain value if the option becomes in the money. However, it can also become out of money quite easily. ATM options are extremely volatile for this reason. Expiration is the last date on which you can exercise your option. For all intents and purposes, expiration occurs at the close of market on the third Friday of the month. Technically, they settle accounts the following Saturday, but since the markets don’t trade on Saturday, expiration is considered Friday. For example the September 2015 standard option expiration is going to be the close of market on September 18. I say standard because nowadays there is such a demand for options trading that weekly expirations have been created. In fact the first weekly option expiration contracts (or weeklies) were started by the Chicago Board Options Exchange (CBOE) in October of 2005 and as time went by they decided to write weeklies on more and more stocks. They operate the same way as the standard options do, but since they aren’t as actively traded as the standard option expiration contracts they tend to have less liquidity – and wider spreads (here’s why that’s a problem) – than the standard strikes do. There will almost always be options available on the current month and the next month out regardless of which option cycle the stock is on. There may also be weekly options and there may be LEAPS options available, too. LEAPS stands for Long-Term Equity Anticipation Securities. These are the longest expiration contracts available. LEAPS also operate much in the same manner as the shorter term ones do, but these have expirations as far out as three years, giving your trade a long time to work itself out. Call options give you the right to buy the underlying at a specific price on or before a specific date, while put options give you the right to sell the underlying at a specific price on or before a specific date. The strike price is the price at which you can exercise your option. Expiration is the last date on which you can exercise your option.